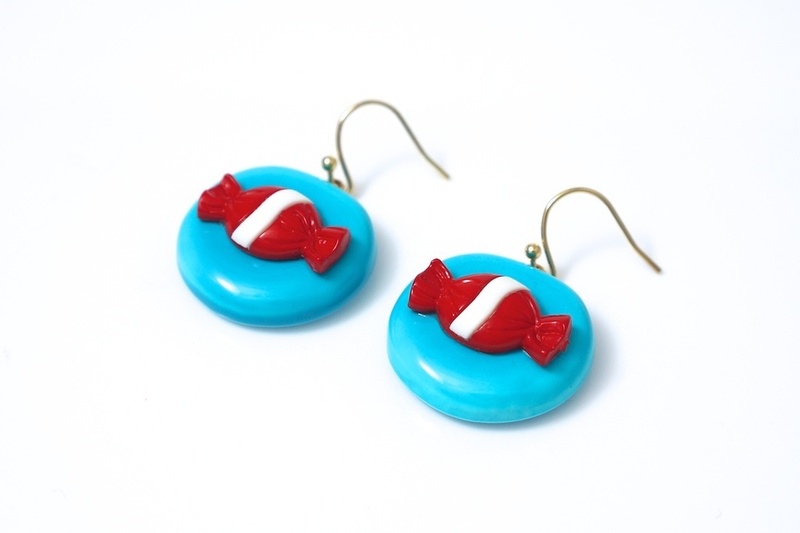 Something sweet for you ears, these Lolly Earrings were a lot of fun to make! Both of the buttons I used in these earrings came from Rollo in Kobe. I chose the glossy blue buttons as a background because they look a lot like candy themselves. I've used this style of button before in some other jewellery pieces I've made (here and here). They're very versatile and their vibrant colours go well with different kinds of buttons. I matched them with these cute red wrapped candies (I think they could be peppermints!) I love the way the colours both contrast and go together and the way the blue offsets the red. 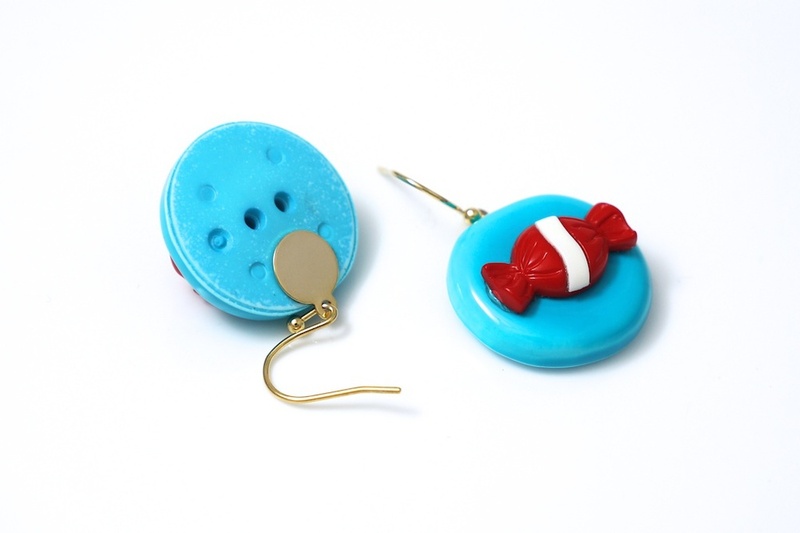 To make them into earrings, I had to cut the little loops off the backs of the lolly buttons first and then glue them onto the blue buttons. After that, I attached some metal plates for the earring hooks. 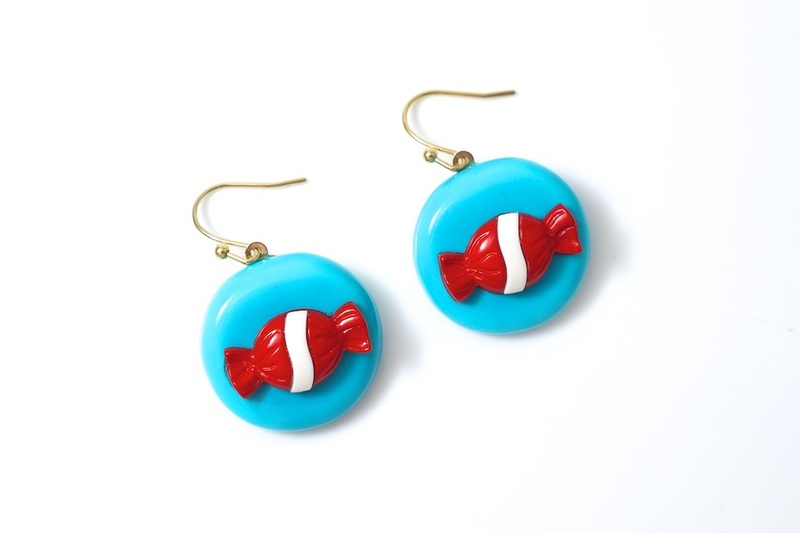 These earrings make me think of kind of candy that you might find in an old fashioned sweet shop like strawberry creams, boiled sweets, aniseed balls and humbugs. I think there's something a little nostalgic about them! Recently, I watched a really great short film by Martin Parr about Teddy Gray's - an old fashioned sweets factory and store that makes all of their lollies by hand - something that's pretty rare these days. There was something mesmerising about watching the workers create the candies by hand. Randomly, when I was making this post, I found a picture I took a few years earlier of a sweets shop in a small village in the Midlands in England. When I zoomed in on the candy jars, I noticed that they were actually from Teddy Gray's! Unfortunately I didn't buy any of their lollies while I was there but I'd love to go to their shop someday and try all of them!